Every Friday, the Harvard sandwich bar in Cleveland cashed thousands of dollars-worth of payroll checks for workers from the Fisher Body plant. The only security was provided by an auxiliary policeman who had been hired to watch over the money. On the sixteenth of April, 1937, Anthony DeCaprio drove Joseph Taylor and Theodore Slapik to the sandwich bar and sat outside with the engine running while they went in. Minutes later, he heard shots—the sound of what witnesses would later describe as a gun battle between the stick-up men and the auxiliary policeman, Lawrence Krull. Taylor and Slapik came out, carrying bags stuffed with cash. They got away with $1,700—a steelworker’s yearly wage—leaving Krull lying on the floor of the sandwich bar with three bullets in him. When they checked the papers the next day, they would have seen that Krull was in a critical condition in hospital. On Sunday, they would have read that he had died. They agreed to split up and leave Ohio. Joseph Taylor went west to Illinois, where he got a job as a layout man with the Ringling Brothers circus, Theodore Slapik went north to Michigan and Anthony went east to New Castle, where he had family, and rented a room on South Walnut street. Four months later, in August, Taylor was arrested in Chicago and Slapik was picked up in Detroit. In October, the New Castle police were informed that Anthony DeCaprio had been seen frequenting a dance hall on Neshannock avenue. Two detectives from Cleveland travelled to New Castle and identified Anthony as he danced with a girl. They arrested him at gunpoint as he left the dance floor. That night, he admitted driving the car in the robbery. He was taken back to Ohio the next morning. All three of the robbers were found guilty of murder and received life sentences in the Ohio penitentiary. Anthony was nineteen years old. Theodore Slapik was released in 1955, when the governor of Ohio decided he was eligible for parole (he had been working as the governor’s driver for some years) and, in 1957, Joseph Taylor escaped from his job in the prison’s sewage disposal plant but was caught two hours later. Anthony DeCaprio served fifteen years of his sentence. After his release, in 1953, he became a truck driver, got married and had five children. He died in July, 2000, at the age of eighty-two. 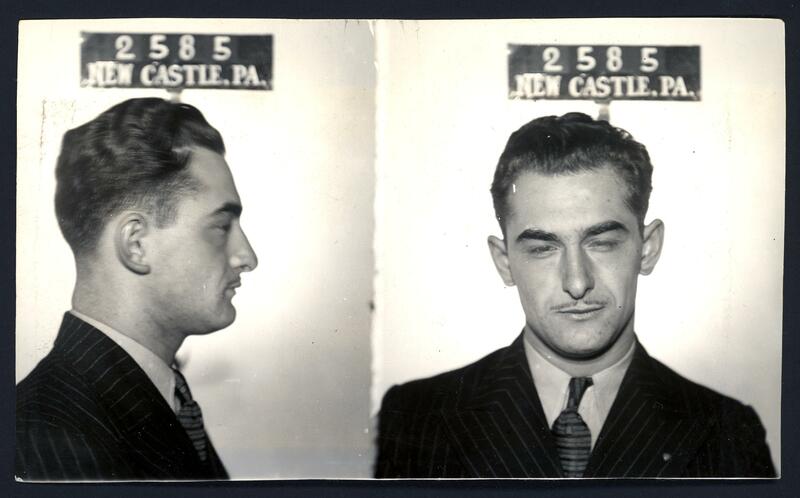 Sources: Lima News (17 April 1937, “Officer Shot In Gun Battle”, 2 August, 1937, “Man Seized In Ohio Killing”, 14 Oct 1937, “Held In Slaying”, 30 Nov 1937, “Former Lima Man On Murder Count”, April 12 1938, “Seven Sentenced”); Piqua Daily Call, 19 April, 1937, “Weekend Traffic Toll Over State”; Circleville Herald, 2 August 1937, “Circus Man, 28, Named Slayer Of Detective”; Lima News, 23 Sept 1937, “Three Desperadoes Hunted After Fleeing Jail”; New Castle News, 13 Oct 1937, “Suspect In Cleveland. 0., Crime Taken”; Piqua Daily Call, 29 Oct 1937, “Life Sentence for Man Hangs Over Him Today”; Zanesville Signal, 1 Nov 1937, “Slapik Pleads Guilty To Murdering Of Officer”; Coshocton Tribune, 3 Nov 1937, “Killer Starts Term”; Times Recorder (Zanesville), 6 Jan 1938, “Trial Of Alleged Slayers”; Coshocton Tribune, 7 Feb 1938, “Three Face Life Term in Ohio Pen”; Times Recorder (Zanesville), 12 April 1938, “Life Sentence For Slayer”; Sunday Times Signal, 10 April 1955, “8 Ohio Slayers Get Easter Commutations From Lausche”; Coshocton Tribune, 20 March 1957, “Convict Nabbed Soon After Making Escape”. Brandon — thanks for letting me know. I guess I’d better rewrite the last line of the story! I hope it was a pleasant surprise to come across your grandfather’s picture on this site, rather than a disturbing one. If you don’t mind, could I ask you a couple of questions? Do you happen to know when Anthony got out? I guess he didn’t serve as long as Slapik, as he hadn’t actually shot anyone. Perhaps it was sometime in the 1940s? Also, I assume Anthony had at least one son — your father. Did he have any more children? I don’t want to share too many details, but it would be a better end to the story about him if I could say a little about his family life after he got out of jail, even if it was just the number of kids he had. If you don’t feel like it’s appropriate to tell me, that’s okay, too. I’ve just bought an old issue of a magazine called “Master Detective” from 1935, which has a story about the Cleveland robbery in it. When it arrives (I got it on eBay, so it’s in the mail), I’ll scan the pages and e-mail them to you, if you like. Thanks Brandon. I’ll rewrite the end of the piece soon, including your new information. I’ll e-mail some scanned-in pages when I get the Master Detective magazine. My mother was married o Lawrence Krull t the time of the murder. It must have been a terrible time for her. Such a waste of life. Do you have anymore information on Lawrence ? Apart from the fact that he was 27 when he died, I couldn’t find out anything else about him, I’m sorry to say. I love seeing the comments of people finding family connections in these posts, it’s so fascinating!! Me too, Olivia. It’s been one of the best parts of this project.